This weekend we went on one of my favorite, toddler friendly hikes and thought Mini Monkey would be happy enough to walk for most of the way on the flat, firm path. Unfortunately it was one of ‘those’ days so not only did he not want to walk but he also needed a few cuddles for persuasion. After a few ‘sit down negotiations’ and some edible bribery he decided that there were lots more interesting things to be seen from Mr MAP’s shoulders and agreed to go ‘up’. I’d like to say that the pace picked up after that but it didn’t. This is what hiking with a toddler is all about. For me, today was about watching Mini Monkey feel the ferns, realise that his beloved honey is made by bees and see him have a good old chat about sticks with Mr MAP. The Giant Baby is finding the world a very interesting place now and is getting very good at resisting naps. No more napping in the car on the way to hikes and no more napping on hikes unless there is the constant rhythm of continuous walking (clearly not today). After looking pretty perky for over two hours beyond his regular nap time, he finally gave in and fell asleep on my back just as we rounded the last bend before the car. To prolong this tiny gift of a nap, I left Mr MAP and Mini Monkey at the car with another snack and took our Hike it Baby friends to see the swamp. I have been along the board walk to the bird hide in the swamp several times before but this was the first time I had ever heard the wonderful chorus of insects and frogs that were singing today. It was so peaceful. Or maybe it was because there were no toddlers within earshot? Either way, it was a very relaxing end to a gentle adventure. Edit: I had wanted to add a lovely video of the singing frogs but sometimes I'm techncally challenged (I can hear Mr MAP scoffing at the word 'sometimes') and I couldn't post the video (yet). One day I may figure this out and I'll come back and add it (promise). Comments from Mini Monkey: Trees have sticks. Bees make honey for Monkey. I want stick...Please? 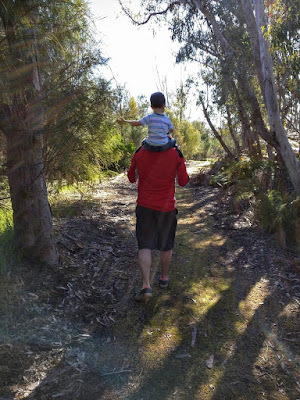 *I run the Perth branch of Hike it Baby so many of our mini-adventures are going to be Hike it Baby hikes and other mini families.